... passed us by on a busy domestic day with little time to spare for birding. However, during the day, we did see the local Common Swifts screaming over our suburban English garden, not long since returned from Africa, a couple of Barn Swallows likewise chittered by and somewhere in the distance a Eurasian Blackcap was chortling away. But perhaps the biggest symbol of the day's events was the completely unexpected garden fly-past by a singing cuckoo, one of Europe's most famous migrants and one, like so many others, that is in decline. 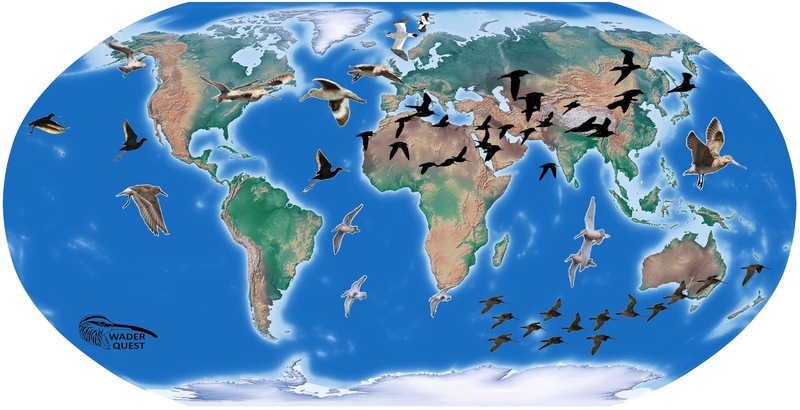 Reminding us of the importance of World Migratory Bird Day the cuckoo got us thinking about our beloved waders. Breeding grounds are vital, as are non-breeding grounds, but, in the case of migrants, equally as important are the stop over points, the refuelling and rest stations of the birds who spend part of their lives in each of two places and almost as much travelling in between. For long distance migrants among the waders, this very often means the inter-tidal zone, that portion of an estuary or beach that lies between high and low tide. This flat and often stark looking zone deceives humans into thinking that it is barren and unproductive, a wasteland that would be much better used being turned into some facet of human life that will, in the end, result in someone getting richer. The Dee estuary as seen from Hilbre Island. But that flat, grey-brown expanse is anything but a barren wasteland, it holds a vibrant community of life only a very small proportion of which is visible to us and that, by and large, is the waders. 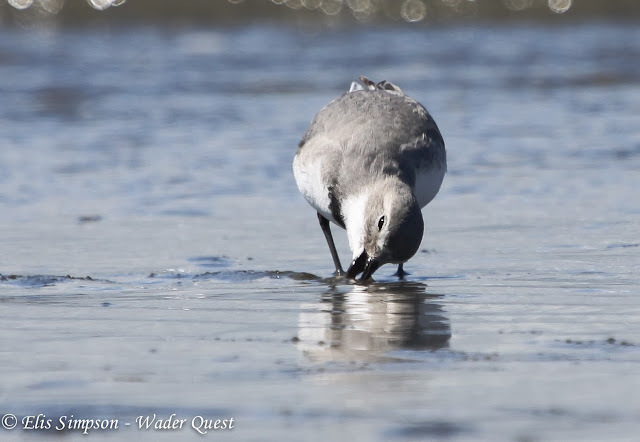 An inspiration of waders, a visual clue as to what lies beneath the surface. The waders are not there because they like to get their feet dirty like a preschool child in his or her first pair of flowery yellow wellies, they are there for the very serious business of getting fat. What we cannot see they instinctively know is there. They search for it using a variety of methods; some probing with sensitive bills deep into the mud, others watching and plucking prey from the surface, some will use their chisel like bills to hack at hard shelled molluscs while the dainty Wrybill will tip its head to one side sifting the mud seemingly forgetting that there are no stones under which they need to insert their unique bills. ... seemingly forgetting that there are no stones under which they need to insert their unique bills. 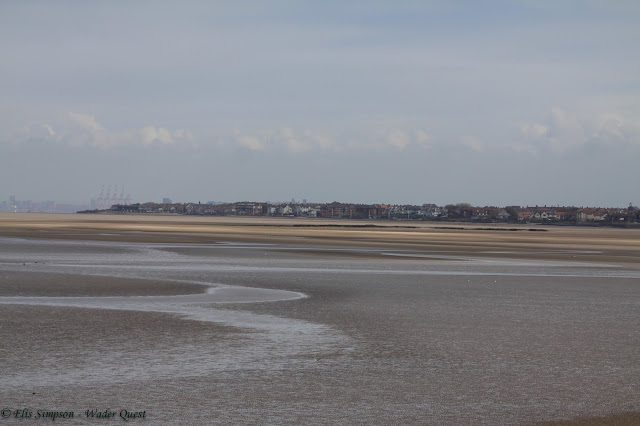 The mudflats of the world are alive with birds at this time of year with many millions of them heading, with a rising sense of excitement, to their breeding grounds in the north. Others in the south will be relaxing with a more staid northerly movement, their breeding duties done. Not one of these millions of lives has the slightest idea what the next hour, let alone the next year will bring, they live from moment to moment, harming no-one (except a few molluscs and other mud dwelling critters) and yet, they face a barrage of obstacles stacking such massive odds against them that it is bewildering that they have evolved to partake in such folly. In the greater scheme of things, migration has been, over the millennia, a strategy that has worked, but now the playing field is not as level as it once was. We, the human race, supposedly (by our own pronouncement) the most intelligent animal on earth, are making life ever harder for these birds; reclamation (can we reclaim something that was never ours? ), coastal development for industry or tourism, pollution and altering of river flows are all affecting our inter-tidal zones across the world. While a few folk soak up the new money derived from such destruction, many thousands more stand idly by, unaware of, or unwilling to see, what is going on. A few doughty souls stand as a thin line of defence against this (excuse the pun) tide of destruction and stand up and give voice to those that have no voice other than the beautiful piping, trilling and warbling that they make that provides a wonderful aural backdrop to some of our most isolated places. It is time that the lives of these tiny wanderers were considered more highly than hitherto, and it is time that the world woke up to the fact that these creatures provide so much more than fun for a few birders, photographers and gunners. They are the very heart and soul of this glorious blue planet, the pulse of their movements is the steady breath of the world and without them our own lives will be forever desolate and ultimately perhaps unsustainable.